UD alumni Robert and Kathleen Siegfried donate to help students and programs. Robert L. Siegfried, Jr., has a fresh, non-traditional philosophy of what it means to be an effective leader – one that focuses first and foremost on the development and leadership of oneself, especially before being able to most effectively develop and lead others. “To me, you can’t lead anybody unless you are first able to lead yourself,” Siegfried said, and during the past 30 years, he has learned to do just that. Siegfried, who is a certified public accountant, graduated from the Alfred Lerner College of Business and Economics in 1981. As the chief executive officer and founder of The Siegfried Group, a national leadership advisory and talent delivery firm, Siegfried has made it his life’s work to help people transform themselves to become better leaders. “I am really moved to inspire transformation within myself and others,” he said. This personal conviction led Siegfried, with his wife, Kathleen Marie (Horgan) Siegfried (College of Arts and Sciences, ’85) and their firm, The Siegfried Group, to make a $1.5 million gift to the University of Delaware. The gift will establish the Siegfried Initiative for Entrepreneurial Leadership and will elevate the stature of leadership studies at the University by providing the financial support needed to create a leadership certification program. The initiative, facilitated by Horn Entrepreneurship and the Center for Economic Education and Entrepreneurship, will encompass elements designed especially for youth, current students, alumni, faculty and community members. Siegfried has been actively working with key professors at UD, especially Dan Freeman, Horn Entrepreneurship Director, to help develop and shape the core curriculum for the leadership courses within the certificate program. 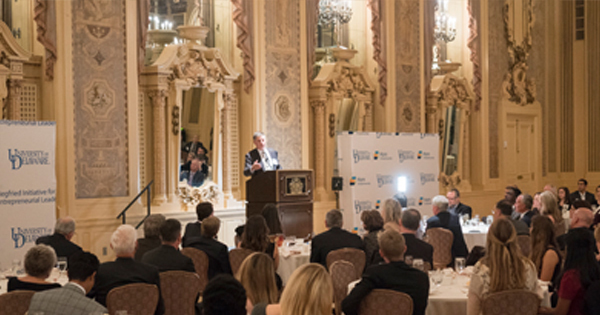 UD Alumnus Robert L. Siegfried, Jr., addresses guests at this year’s Siegfried Award for Entrepreneurial Leadership dinner on Nov. 1, 2017. 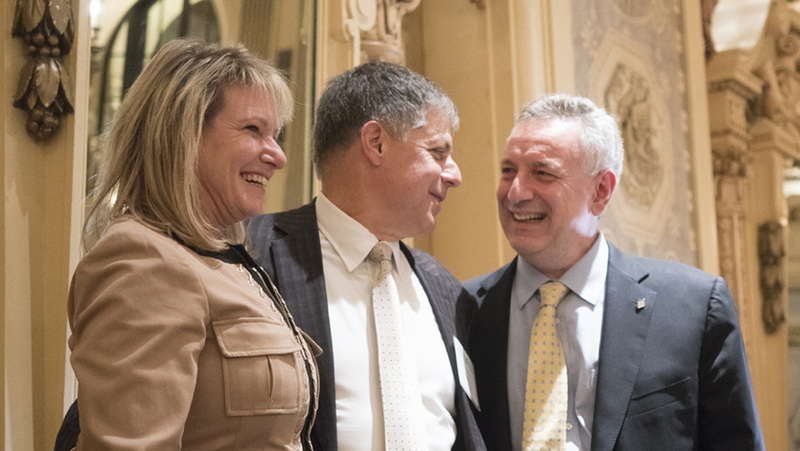 President Dennis Assanis expressed his admiration for the Siegfrieds at a dinner held on Wednesday, Nov. 1. “At UD, we want to make exponential change in the world, and the Siegfrieds understand and share this same vision,” Assanis said. Assanis, along with Bruce Weber, dean of the Lerner College, thanked the Siegfrieds for their continued support of UD. 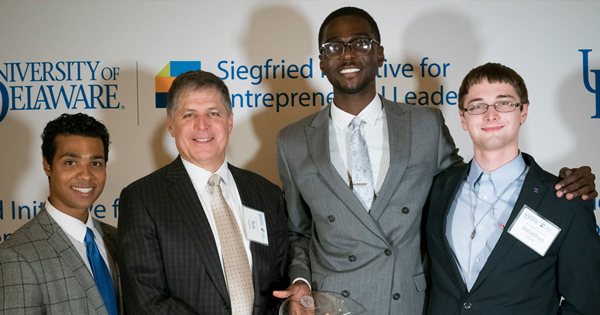 In addition to creating this fund, the Siegfrieds previously established the Siegfried Award for Entrepreneurial Leadership, which annually recognizes a person or group for their remarkable contributions to advancing entrepreneurial leadership, knowledge and practice. From 2012 – 2017, Rob also served as chair of the Lerner College Advisory Board. According to Kathy, before Rob was able to most effectively teach others how to become better leaders, he needed to become a student of leadership himself – learning from other experts and taking classes – all while working with hundreds of financial executives, entrepreneurs and employees to become better leaders. Students attended the Nov. 1 dinner at which Robert L. Siegfried, Jr. (second from left) and his wife donated $1.5 million. The students were Joel Amin (far left), Garry Johnson (second from right) and Jonathan Wood (far right). Together, the Siegfrieds are excited to bring Rob’s new school of thought on leadership to hundreds of future Blue Hens at a place that is so dear to them. With Rob’s deep commitment to prepare future leaders and Kathy’s endless support of this shared passion, the University looks forward to the great things that will come from the Siegfried Initiative for Entrepreneurial Leadership. Rob and Kathy, both graduates from UD, began dating in the mid-eighties soon after meeting through a mutual friend at a UD football tailgate. In 1988, Rob had a dream to start his own CPA firm that would transform the accounting industry. With Kathy’s support, who did everything from marketing and HR to accounting and administration, the once small company in Wilmington has grown into a national firm. The firm was recently recognized as the fastest-growing CPA firm in the United States, with approximately 700 employees and 18 offices across the country. Rob serves on the Lerner College Advisory Board and is co-founder of the Siegfried Youth Leadership Program™, which brings his passion for leadership development to students in grades 8 – 12 in the greater Delaware area. The Siegfried Group, LLP works alongside financial executives across the nation, on their most important accounting and finance projects. Filled with an innovative spirit and led by an ambitious entrepreneur, the firm provides unique leadership advisory and talent delivery services. At the heart of the firm is an approach to individual leadership and the continual pursuit of helping people grow both personally and professionally. As a whole, the firm values having fun, being fair, and building and sharing stakeholder value.